To view a golfer's scores, highlight the golfer and press Enter or click the button View Scores. Something similar to the following screen will appear. This window lets you view all of the golfer's scores. 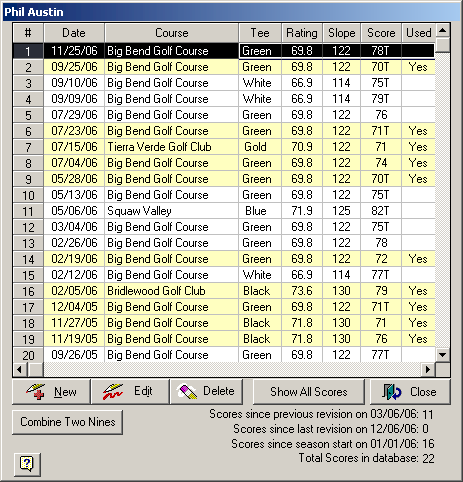 Scoring information includes the date, course played, tee played, rating, slope, and adjusted gross score. The Used column indicates if the score is used in the calculation of handicaps. The golfer's handicap at the time the score was entered is also displayed. Scroll the list to the right to see this column. If you want to view more than the last 20 scores, click the Show All Scores button, and scroll down the list to view the additional scores. To add a score, click the New button, or press the Insert key. Note: Using speed keys is a much faster way to add scores, see Entering Scores Quickly. To edit a score, double-click the score, highlight the score and click the Edit button, or press the Enter key. Highlight the score to delete and click the Delete button, or press the Delete key.